Let us get one thing straight, it is not easy being Rahul Gandhi. To have lost your grandmother and your father to highly publicised assassinations is not something that anyone can even empathise with. But to then enter the political picture in India and immediately be portrayed as a ‘Clown Prince’ and a pappu (idiot) by the Opposition and doing yourself no favours by slips of the tongue (far too many) and being painted as an arrogant capo of the Lutyens mafia, must have taken a personal toll. It says a lot about Rahul Gandhi that he brushed aside the insults and innuendoes and even embraced his image as a pappu, with Congressmen themselves spreading ‘Pappu Pass Ho Gaya’ stickers on WhatsApp after the State election results a few weeks back. Of course, there is no doubt that a rejuvenated Congress is good for Indian democracy, but it should be noted that a series of missteps by the Bharatiya Janata Party and severe anti-incumbency had their roles to play in the Congress’ recent electoral success. But 2019 will be a different dilemma altogether for Rahul Gandhi and a very different challenge from the one that Prime Minister Narendra Modi faces. 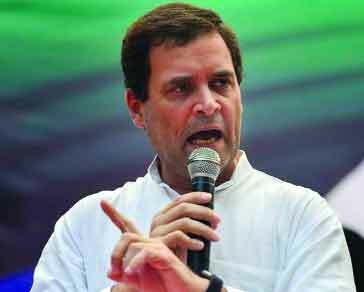 Rahul Gandhi has to play the unifying force of a disparate group of political characters from Trinamool Congress chief Mamata Banerjee to Bahujan Samaj Party supremo Mayawati, many of whom harbour their own ambitions of becoming the Prime Minister. One thing is certain: It is becoming increasingly difficult to predict who will occupy 7, Lok Nayak Marg come end-May 2019. Frankly, this was not predictable this time last year as Rahul Gandhi ascended to the top post of the Congress. He was back then still pappu and portrayed as someone born with a big, fat silver spoon in his mouth. But he has managed to dispel that notion through a combination of diligent work, smart electoral strategy and allowing the Congress to swallow some pride when it comes to allies. There is no doubt that some of the allegations that he has made might not stick to Narendra Modi, notably questions on the Rafale deal, but to his credit, he single-handedly made it an issue which caught the Government off-guard. Rahul Gandhi has realised that Modi and Amit Shah are politicians who can fight on the offensive but fail miserably on defensive strategy, again the Rafale deal being a case in point. The Congress and, indeed, Rahul Gandhi’s strategy of painting Modi as financially, morally and ethically corrupt is working, but it might not work fast enough to defeat the BJP at the hustings. However, some of the mud is certainly sticking. With Modi disavowing intellectual talent in his Cabinet and elsewhere in the Government along with avoiding any critical media, more and more mud is sticking. This, coupled with a denial of obvious disasters like Demonetisation, makes the BJP vulnerable in 2019, not something that anyone predicted between 2014-17. Indeed, some even believed that India’s version of a thousand-year Reich was upon it. But much like that Reich, this one might also be hoist by its own petard. It remains to be seen if Rahul Gandhi will be the fourth generation of his storied family to govern India. Some of the disparate alliances he might have to form are with people who either dislike him or out and out hate him. Will the recent defeats mellow down the BJP when it comes to its allies and potential partners, and will Modi realise that his first term might become his only term if he doesn’t use his last 10 weeks in office before the elections are announced to do something significant that doesn’t involve a temple? But 2018 has certainly seen the coming of age of pappu. Pappupedia, a pejorative website run by BJP surrogates, might indeed need an update or two, come 2019.